Though a small crop for Marlborough Sauvignon Blanc, vintage 2010 has proved to be of exceptional quality for white wines throughout New Zealand, and very good for red wines. 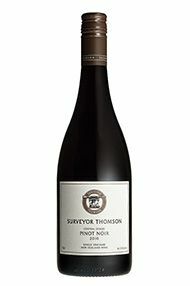 Our friends at surveyor Thompson have produced a first rate wine in 2010 after a fine warm summer and early autumn. It displays an attractive medium deep colour, some lovely spice here, with thyme and rosemary notes. Juicy fruit in the middle, some savoury elements adding texture to the back, long and concentrated. The grapes were hand picked into six very distinct lots and fermented separately.35% whole bunch on average for texture and extraction of more tannin. Indigenous yeast was used to ferment the wines to dryness the wines were hand plunged three times a day. The wines spent a total of 29 days on skins on average, to extract structure, colour, aromatics and finesse. Maturation took place in 225 litre French oak barriques of which around 35% were new 3 year air dried French oak and the remainder one and two years older. 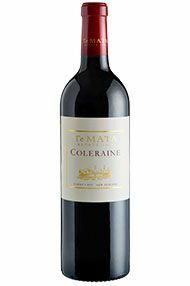 The Coleraine 2010 has a youthful dark crimson colour and displays Coleraine’s gorgeous floral aromas, together with macerated blackberries woven with graphite and thyme. The palate is pure and very precise, building in intensity, with a long fine tannin structure providing great length. A blend of 58% Cabernet Sauvignon, 36% Merlot, and 6% Cabernet Franc, it will continue to develop in bottle and provide great enjoyment up to 15 years from harvest. 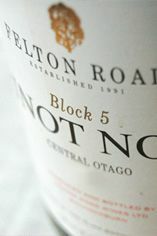 Felton Road Block 5 Pinot Noir - Dense rich purple colour. Heady, violet scented fruit, full of grace. Utterly gorgeous even in youth, this will surely develop complexity with age. The texture is already there and the fruit acid balance is just right. Impressive (once again!). 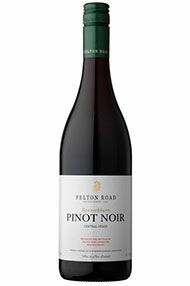 Black forest fruit, sweet entry to the palate and an immaculate acid balance define this excellent Central Otago pinot from the region’s masters, the Felton Road team. There is impressive density of flavour and an excellent sense of balance.